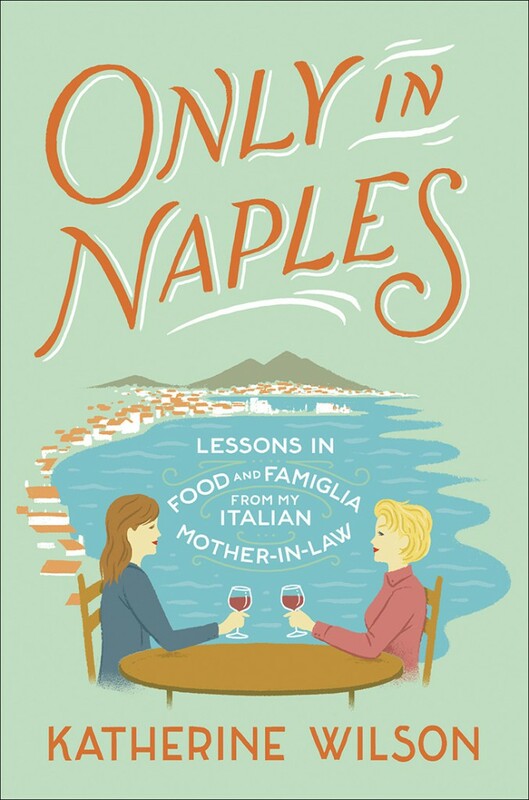 I have a lot of favorite moments in Katherine Wilson’s hilarious memoir, Only in Naples, but my most favorite is when she describes her Neapolitan mother-in-law, Raffaella, staring at a ring of measuring spoons in Wilson’s American kitchen “as if they were an archaeological find.” Cooking in Naples is a feel-as-you-go expression of love, not an exercise in precision, just as Neapolitan family dinner is the focal point of the day, not one more box to check off on the unending to-do list like it is here. Wilson, a sheltered Princeton grad from suburban D.C., found herself in Raffaella’s kitchen soon after she moved to Naples in 1996, taking what she thought would be only a three-month job with the U.S. Consulate. She hadn’t counted on falling in love with Raffaella’s son, Salvatore, marrying him, and subsequently making Italy her permanent home. Nor had she counted on falling in love with her mother-in-law, who isn’t the plump flour-dusted mamma stirring at the stovetop, but a fit, stylish woman-about-town who, right from the start, folds Katherine into her home as if she’s family. As you might imagine, food and cooking play a central role in the book, as Raffaella teaches Wilson — who can barely boil a pot of spaghetti — how to find her way in the kitchen. There are only a few recipes in the back of the book, but they are all attached to important milestones in Wilson’s life: A classic Ragu, one of the first dishes Raffaella ever made her; Insalate di Polipo, an octopus salad that was the source of much consternation at the family’s feast of Sant’Antonio; and Parmigiana di Melanzane, Raffaella’s signature dish, which Wilson has been nice enough to let me share here on DALS. Warning: You are about as likely to find a conventionally written recipe below, as you are to find those measuring spoons in Rafaella’s kitchen drawer. And that’s exactly what makes it’s so charming. Your eggplants must be long, skinny, hard, and so dark they’re almost black. Insomma, like a tall, fit Italian woman after a summer on the beach in Positano. 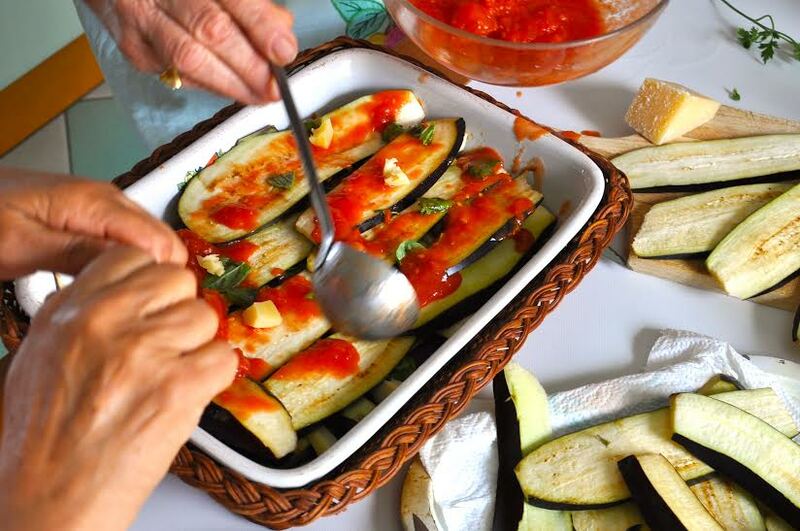 Eggplants with the least pulp and seeds (found in summer and early fall) make the best parmigiana, Raffaella says. The ones you find in winter tend to be fleshy and moist inside and need to be dried out for at least a day. Otherwise all their white flesh will absorb the frying oil and you’ll get a greasy parmigiana. One of the worst insults you can lay on someone’s parmigiana in Naples is that it’s greasy. To get rid of the moisture in the eggplants, let them perspire for as long as possible. When you take them off the tray to fry them, you’ll notice wet patches on the tray where they’ve been lying. This is good: it means they’ll fry quickly and lightly, without absorbing oil. Before frying the eggplant slices, begin your tomato sauce. With an immersion blender, grind up the contents of the cans of tomatoes (remember, the ingredients should say: TOMATOES, e basta) and put them in a pot with a few of the basil leaves and one smushed garlic clove. (Gli dai un pugno in testa, e si toglie la camicia, Raffaella says: Punch it on the head and its shirt will come off.) Cover the pot and cook on low for about 20 minutes. (After 10 minutes, take the lid off or wedge your wooden spoon between the rim of the pot and the lid. We don’t want watery sauce.) Add salt to taste. As the sauce simmers away, turn back to your bathing beauties. Line a tray with paper towels, to receive the slices of eggplant after they’ve been fried. Heat up your peanut oil so that it’s hot enough to make the pieces sizzle but not so hot that they smoke. (Try the sizzle test with the edge of one piece before sliding them all in. If the piece bubbles, the oil is ready.) Now ease the slices in for their hot bath. Put in enough pieces to cover the surface of the oil, but not so many that they’re crowded on top of each other. (Think of vacationers on the beaches of the Amalfi coast in mid-August. People are touching each other, but it would be uncool to get on top of anyone.) Flip them after about a minute, and then take them out when you see that they are becoming light brown. (This should happen pretty quickly if they’ve sweated properly beforehand.) Use a skimmer to take the slices out, and hold them over the pan to let the excess oil drain off before positioning the eggplant on the paper towels. Cover the slices with more paper towels to absorb the oil (Repeat: My parmigiana will not be greasy!). Make sure the oil is still hot enough for the next batch—if not, pump up the fire. After frying the next round of slices, position them on top of their predecessors, separated by paper towels. Repeat the process until you’ve fried all the eggplant. Preheat the oven to 375°F. Now assemble the layers of the parmigiana in an 8-by-8-inch casserole dish. Start by putting a few spoonfuls of tomato sauce on the bottom of the dish and smoothing it into a red carpet with the back of your wooden spoon. Then arrange the first layer of eggplant slices (slightly shriveled and brown now, as if they’ve spent too much time at a tanning salon) side by side across the bottom of the dish. Spread another layer of tomato sauce on top of the eggplant, and sprinkle a few spoonfuls of Parmesan cheese evenly across it. Tear some basil leaves with your fingers (never touch basil with a knife, because it alters the taste! Mi raccomando! ), and drop the torn leaves to the north, south, east, and west. Then distribute about a third of the fior di latte cubes. The next layer of eggplant slices should be placed crosswise to the one before, so that the parmigiana is easier to cut. Continue with the same pattern—eggplant slices (each layer running crosswise to the one before), sauce, Parmesan, basil, and fior di latte. Stop the pattern after the Parmesan. The top of the parmigiana should be Parmesan-dotted red, with only a vague hint of the brown treasures inside. Bake at 375°F for about 25 minutes, or until you see a crust forming on the top. Serve at room temperature. If your parmigiana turns out greasy or is swimming in oil, please don’t mention to anyone where you got the recipe. This may be my favorite way to read recipes. Thanks for the laughs, and the parmigiana recipe. Keep on sharing the love outside the home..
For the restaurateurs who need to have a strong online presence by marking them in different social media platforms, we’ve designed an amazing tool that will help the restaurants do the same. Get the social media presence your brand needs. Reach out to over 50,000 people annually. Haha! I am dying at “as if they’ve spent too much time at a tanning salon.” This looks delicious.